2 Who is goddess Parvati? Goddess Parvati is the consort of Lord Shiva and daughter of the mountain king great Himavan and queen Meenawati. In this post, we have shared the short but compelling story of Goddess Parvati but before that let's understand who is goddess Parvati? Goddess Parvati is the central deity in the Hinduism; she is the consort of Mahadev also referred as Gauri, Uma, Kali, Mahadevi. There are a few points which are significant to know about Goddess Parvati. Goddess Parvati is the manifestation of Goddess Shakti also known as Adishakti. Mother Parvati is the second consort of Lord Shiva. Puranas also describes her as the sister of Lord Vishnu. Divine mother is the reincarnation of Goddess Sati. Goddess Parvati is the daughter of Himavan and Meenawati. Lord Ganesha and Lord Kartikeya are the sons of Shiva and Parvati, and Ashok Sundari is the daughter. Lord Shiva is a unique, impressive and incredible Lord in all aspects. He has infinite attributes each quality of Shiva reveals why Shiva is a magnificent Lord. Therefore ordinary lady cannot manage with the dynamics of Shiva. Only Goddess Shakti can cope up with Shiva's phenomena. If you are confused about the question are Parvati and Sati Same? Then, here is your answer, Yes, they are same. Energy is neither created nor destroyed, but it can take transformations. Parvati and Sati are both the physical manifestation of Goddess Shakti who is also known as Adishakti. After the loss of Goddess Sati, Lord Shiva decided to depart himself with worldly phenomena. Mahakaal became Vairagi again, that disturbed the balance of Trinity. This time Goddess Adishakti decided to manifest herself as the daughter of mountain Himalaya's as Parvati. There are several differences between Parvati and Sati which are defined below. Goddess Parvati is the goddess of Fertility, compassion, and Devotion whereas Goddess Sati was the goddess of longevity. Goddess Sati was the daughter of Prajapati Daksha who was a hater of Shiva and an egoistic man, but later he turns out to be greatest devotees of Shiva. On the other hand, Father of Parvati was an adherent devotee of Lord Shiva. Goddess Parvati is more focused and calm and free from worldly desires; whereas Goddess Sati was not focused and all. 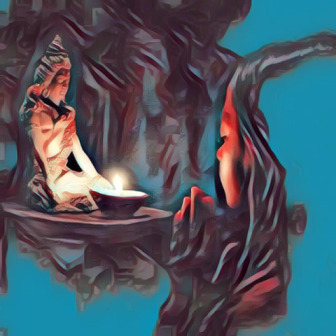 Parvati achieved Shiva as her husband by lots of hardships and penance upon Shiva whereas Sati didn't face that level of complexity as the comparatively to Parvati. Parvati invoked the Adishakti within before getting married to Shiva whereas, Sati didn't awake Adishakti before getting married to Shiva. Goddess Parvati is a warrior who has mastered diverse arts whereas Sati lacks in these qualities. It all started when the goddess Sati soul left the human body and returned into Adishakti. After the Loss of Goddess Sati, Mahadev Shiva went to the extreme pain and inexpressible agony. Lord Shiva forgot everything about his divinity, and roam over the entire universe by carrying the Sati body. By seeing Shiva's unbearable grief, Lord Vishnu became sad. By seeing no way to make Shiva come out of Sati's death, finally, Lord Vishnu cut the Sati's dead body into 52 parts with his Sudarshan Chakra. Each body part which fell on earth became the shaktiPetha. After that Shiva's realized that Sati is no more hence Shiva appointed Bhairava in each ShaktiPetha. Meanwhile, Shivgans including Nandi, (the bull of Shiva) with ghosts and apparition were weeping on the loss of their Mother Goddess Sati. Shiva left Kailash Parvat and tried to become isolated from everyone. For that isolation life, Shiva reached the kingdom of Himavan. It was heavily snowing in Himavan's kingdom, and the temperature was remarkably cold there. Shiva reached there, and Maheshwara saw an isolated cave. It was hard for any human to reach such a freezing location. Before the entrance made by Shiva into the cave, Nandi called the name of Maheswara, but Shiva put his trident outside the cave and entered into the cave for meditation. Nandi decided to wait outside the cave as a Meditating bull. Many Years get passed, Shiva stays in Vairagya and Nandi remained sitting outside the cave waiting for Shiva. By seeing Shiva's rearmost Vairagya state Demigods and broken Trinity decided to worship Goddess Adishakti. Goddess Adishakti appeared in front of them and replied to their request that soon she will take birth as Himavan daughter as Parvati to get married to Shiva. Queen Meenawati and King Himavan wedding took place just after Shiva and Sati wedding. Shiva and Sati stayed for few days in the kingdom of mountains. First-time when Mainawati saw the goddess Sati, she had an ecstatic feeling of having a daughter, exactly like Sati. She invited Sati and organized a personal feast for her. Queen of the mountain offered delicious sweet dishes for Sati with a feeling of motherhood for her. Sati knew the feeling of Mainwati for her. At the time of leaving the human body, Sati desired to born again as the daughter of the Meenawati. Meanwhile, Demigods appeared in front of Himavan and Mainawati. They advised the couple to do penance upon the goddess Adishakti. In return for their devotion, Goddess has to take birth as their daughter. They did penance on Goddess precisely and received the desired boon in return for their austerity. After few years Queen of mountains gave birth to the beautiful girl. The girl was born as the princess of the mountain king, Narad named her Parvati (Daughter of the great mountain king). On the birth of goddess Parvati, demigods showered the petals of the flower on Parvati. The people of the kingdom were happy with the birth of the princess, Parvati. Years keep passing, and Parvati attained her womanhood. Parvati was an elegant girl who was highly skilled in all the arts, especially in cooking and decoration. From her childhood, Parvati loved to chant the Om Namah Shivaya and extol the entire Yogi's community. She had a special attraction towards Damru, Meditation, Bhasma. On Lord Vishnu orders Sage Dadhichi enlightens Parvati about Shiva's charm. Dadhici gave her a small idol of Shiva and told her to have full faith in Shiva. Sage Dadhici tells about Shiva's History to the Parvati. Sage defines why Shiva is his Aradhya, and what qualities Shiva possess like he is immortal, unborn, omniscient, supreme conscious form. Parvati asks many questions related to Shiva and sages answers all of them. After knowing about Shiva, she comes closer of Shiva and starts loving Shiva. Why is Shiva known as Rudra? Why Shiva is too dear to Lord Vishnu? Why Shiva is the destroyer of Darkness? As mentioned above after getting the answer she loved everything related to Shiva. Parvati's love was pure for Shiva. Parvati's love and devotion kept growing towards Shiva. Sage Dadhichi shared a special bond of Devotion, affection with both Shiva and Parvati. This bond was a bipolar bond of affection which had two dimensions. In the first-dimensional bond, he sees Parvati as the manifestation of Adishakti and divine consort of Shiva whom he worships as the mother. In the second-dimensional bond, Sage Dadhichi sees Parvati as the same little child who is too dear to the sage as his daughter. One day when Himavan and Meenawati were stressed regarding Parvati wedding. Sage Narad appeared and saw the palm astrology of Parvati. Narada spoke to the Himavan that their Daughter is extraordinary with all the divine attribute. She is a human morph of nature. Parvati's marriage will be a boon to the world. She will marry a yogi who will own no home and certainly a Vairagi who loves to smear Bhasma on his body. Parvati was aware of whom Narada was pointing. After listening to Narad, Meenawati gets Shock; She was willing a handsome man for her daughter, Parvati. Narad Assured to the couple that all these qualities resembled Lord of Lords, Mahadev. Goddess Parvati gets delighted by listening to Sage Narad words. In her heart, she already assumed Shiva as her husband. Narad advised Parvati and couple to have faith in Shiva by meditating upon him. Himavan enquired many questions to Narad to fulfill his curiosity. Mountain king asked another question to Narada I have heard several sages saying Shiva have promised Sati that he will not get married to any other lady. Then how will my daughter get married to Shiva? Narad smiled and replied to Himavana, Dear King in the previous birth your Daughter Parvati was Sati. It is Parvati's second birth which she took to achieve past love. Narad takes leave from King Palace and after that King advised Meenawati to talk Parvati about doing penance to get Shiva as Husband. Queen goes to Parvati's room and sees the glowing skin of Parvati. She becomes incapable to advise her to perform penance upon Shiva. Parvati gets the unspoken words of her mother and assures her that she will do austerity upon Shiva with complete faith. After some time King came to know about a Yogi who came to his kingdom and meditating in one of the isolated cave. Himavan was confident that yogi could not be anyone else than Bholenath. Only Shiva can live on that extreme conditions. Himavan somehow reached to the cave to welcome Yogi. That Yogi was Shiva in that cave. Himavan welcomes Shiva with full faith & devotion. Shiva opens his eyes and sees Himavan greeting him. Shiva replies to the king that he has come here to meditate, and wants no one to disturb him. Himavan promises to Shiva that no one will come here for creating the disturbance for him but allow him and his daughter to serve their Mahadev. Shiva sees the daughter of Himavan standing behind her father. Shiva closes his eyes, understanding Sati's return as Parvati. 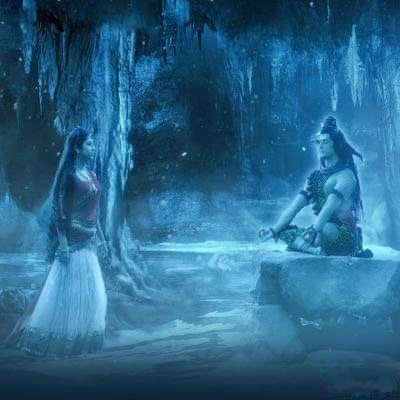 In the inner vibes, Parvati tells to Mahadev; I have come again, my lord. This time no one will be able to separate us. This time there was resistance from Shiva's Side; natraj addresses Parvati; Gauri, it is not that easy. Shiva opens his eyes and orders Himavan to come without his daughter Parvati. A lady is the door of Maya; a young lady is a disturbance for a yogi. I m a Yogic person your beautiful daughter is a distraction. Don't let her come with you next time. Parvati understands that Lord Shiva was ignoring her. whereas Himavan was numb by Shiva's words but goddess Parvati takes a stand on behalf of her father. Goddess Parvati - "Oh Lord, Your words define that you too are affected by my presence or nature?" Shiva - " Princess, In reality, I m destroying illusion by my penance. I m free from nature and its element." Parvati - "My Lord, do you know I m the part of nature? You are the man without me you are irregular, inactive. Without me, no one will know about you?" Shiva - "Parvati, it seems like you are a follower of Sankya Ideology, but you don't know about Vedanta. You should have read them before coming here." Parvati with lot's of innocence for Shiva asks another question. Goddess Parvati -"My lord, if you are above Maya and nature, then, why do you meditate? Most importantly, why do you get scared when I come near to you?" Shiva gets delighted after examining Parvati's intelligence and replies. Shiva -"All right Parvati, as you say, I can see your faith in me. Therefore, whatever provision of this place you want, you can have." Goddess Parvati gets delighted by Shiva words and returns to her Palace. Every day she used to come with her friends for cleaning the surroundings and worshipping her god to whom she internally supposed to be her husband and everything. Many years get passed Shiva does not observe her dedication and love for him. One day when Shiva opens his eyes and sees the kind of devotion Parvati has on him. Shiva starts thinking, Parvati has a tremendous reverence for me still there is some element of egoism which is present on Parvati. These are the impurities within Parvati, and She will not get freed from them; until she starts the Penance. By thinking that Shiva closed his eyes, and start meditating. Parvati never got offended by seeing Shiva dispassion towards her. She kept following her daily routine of adoring Shiva with pure reverence. In this post, we have shared, The Goddess Parvati story. If you liked the post, please feel free to share it on the web. Your share will help youth to get connected to Lord Shiva which will bring inner peace to them. They will also come to know, who was Goddess Parvati? We appreciate your social media share. Thanks for your valuable time and kindness. If you like reading about the great Lord Shiva; You can subscribe to our blog Viyali through email.